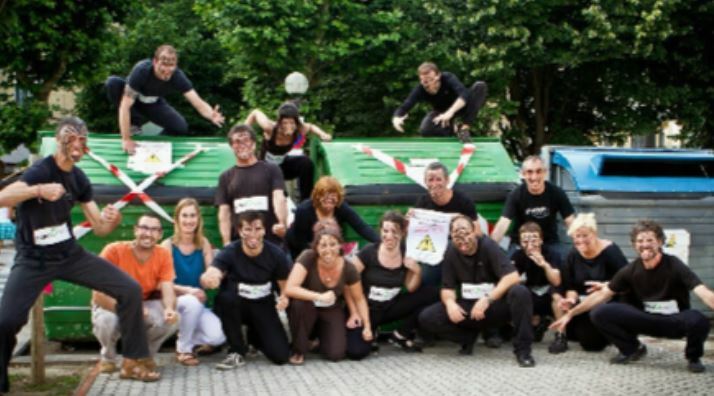 “Recycle the grey bin” is the name of the campaign that has been conducted Zabor Zero – Zero Waste Basque Country in recent months to denounce the containers for mixed waste as one of the main reasons for low recycling rates and high levels of waste generation. This campaign has consisted in sealing the containers for residual waste in various towns with two main aims. Firstly, to highlight the inconsistency between what some politicians say and what they do and secondly, to underline how a well-implemented separate collection at source makes this container redundant. Many politicians say one thing and then do the opposite. Even those who know little about waste management understand that the materials separated have a value and it’s only when they are mixed up that waste is generated, with its impact on the economy and on the environment. The containers for mixed waste are the instrument to justify not separating waste and mixing up resources. One should just observe how they are designed to accept anything of any size and texture. It’s because they have been placed “there” that we got used to having them “there” but this is not the result of a divine action but of a political decision; A political decision taken by someone elected by us and which is responsible for promoting waste generation and costs money to all of us. What is the point of using our taxes to finance the generation of waste? What sense does it make to invest public money to generate a problem? When are we going to break this vicious circle? The second goal was to highlight the impact of removing the container for mixed waste on separate collection. Indeed, the systems that have marginalised the collection of residual waste are the ones with best separate collections. Despite 90 to 95% of the waste generated is recyclable, in most cases only 20 to 25% is separately collected. The remaining materials are mixed and become garbage. Whilst in the practices without container for mixed waste separate collection ranges between 70% -95%. Experience proves that very little residual waste is generated when the trash container is removed. In the recent years, some towns in the Basque Country, especially in Gipuzkoa, have made great changes in waste management. This has allowed the discussion to evolve from “What to do with the waste generated?” to the new zero waste paradigm “What to do in order not to generate waste?” In this transition towards zero waste model there have been profound changes in the system of waste collection with the door-to-door system becoming the target for political fights. Some have opposed the door-to-door separate collection system to a system with 5th container to collect organic waste. The results have differed and new systems have been tried in the search of high separate collection rates; mixed systems with two streams collected door-to-door (organic and non-recyclable) or one stream ( for non-recyclables) with other fractions in containers, whilst small villages compost all organic waste in situ, and lately collection systems with containers with controlled access (by chip). All these systems are different but they all have in common that they have removed the container for mixed waste or grey bin from the streets and this has allowed separate collection rates to increase. Since the campaign was designed and launched back in June 2014, the message has been reaffirmed and even enriched with new experiences. For instance in Azkoitia, 11,000 inhabitants, the container for mixed waste was removed and replaced with tailored poles to collect non-recyclable fractions whilst keeping the other containers for recyclables where they were. As a result separate collection rates increased from 40% to 80%. 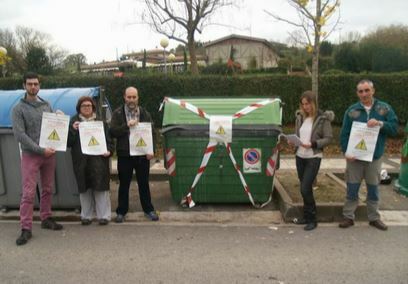 Another example is Tolosa, with 20,000 inhabitants, where the mixed waste containers were replaced with two kind containers with limited and controlled access for residual waste and organic waste and as a result separate collection has gone from 26% separate collection over 70%. 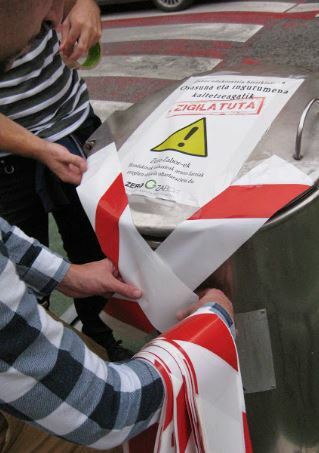 In Gipuzkoa we have experimented different sorts of systems and hence enlarged the set of tools available to organize a good separate collection of waste. As a consequence the authorities and politicians are increasingly less capable of finding excuses not to act. Zero Zabor will not tell to politicians what system to use because the best option might change from town to town, however we will continue to demand them to fulfill their duty of protecting the health of their citizens, the environment and the future generations according to the best practices in Europe. The time to look for bad excuses is over!